Words and pics by Peter Boel. My participation in the Australian and New Zealand legs of the World Formula Junior Series in my Lola FJ was a less than spectacular success, suffering persistent minor engine problems that had the car running well below its best, finally having a bigend failure at Teretonga. The only race in New Zealand where the engine ran on song was in the Taupo event where I came from the back of the field to fourth place. 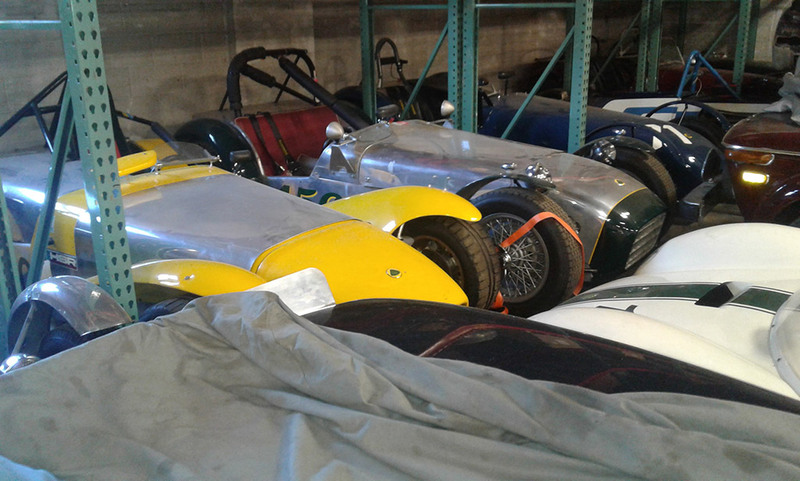 From New Zealand the car was travelling to the US as part of the West Australia Race Museum team (WARM) which had a container of nine cars heading there for the seven race US Series. Having had so much trouble with the car in NZ, in frustration I put the car up for sale not really expecting it to sell. However, the minute the container hit US soil the car sold, leaving me entered in the first three US events without a car. Luckily Neil McCrudden from the WARM team had a spare ‘Panther’ which he offered me to drive. The Panther is a one-off FJ built in Western Australia in period based largely on a Brabham BT6. Its restoration had been completed just before the team left Perth and was really still in shake down state, but I was very happy to get the drive. 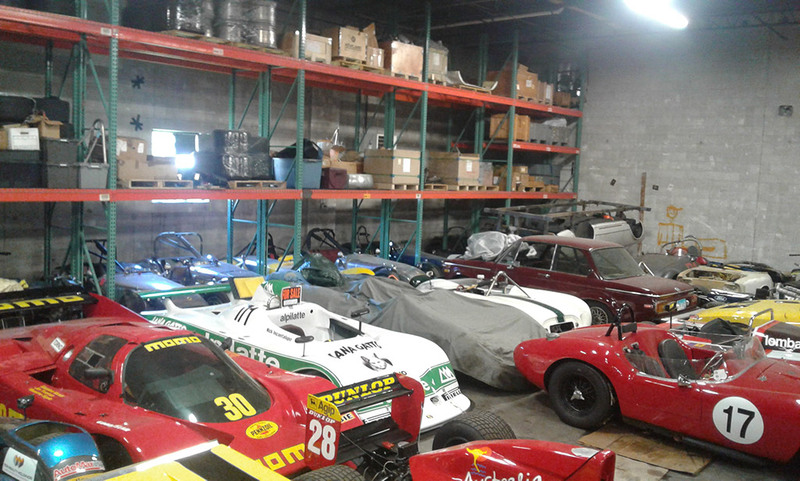 In the US, the cars were housed at GMT Racing owned by JR Mitchel in Connecticut where he prepares customer race cars and takes them to meetings. 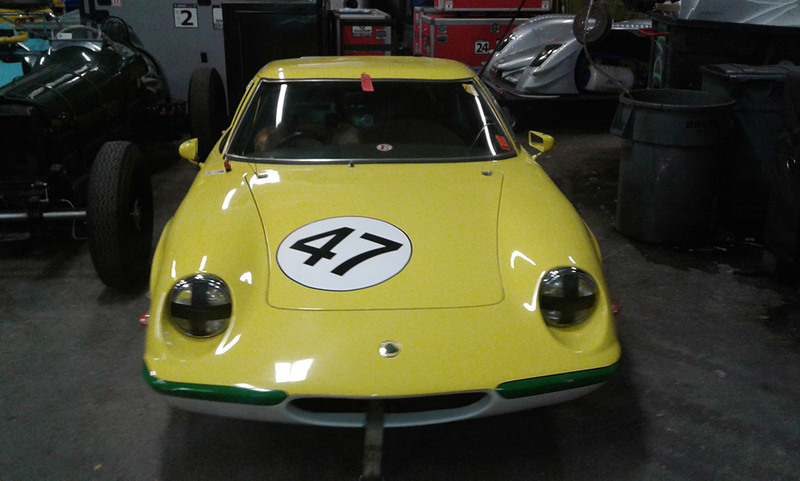 JR had competed in the Australian and NZ Series in his Lotus 18 and is a regular visitor to our events, looking after various US competitors who like to race here in their off season. To move the cars to the circuits in the US we’d arranged to rent one of JR’s semi-trailer transporters. The transporter can take six cars and has sleeping accommodation for three and despite its size can be driven on US roads on a car licence. 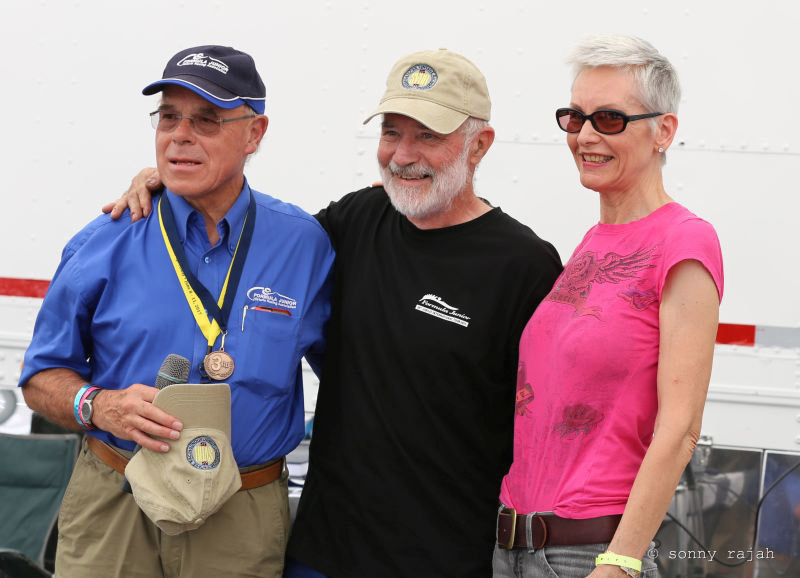 Lance, one of the WA competitors, was to be the driver and I was navigator. 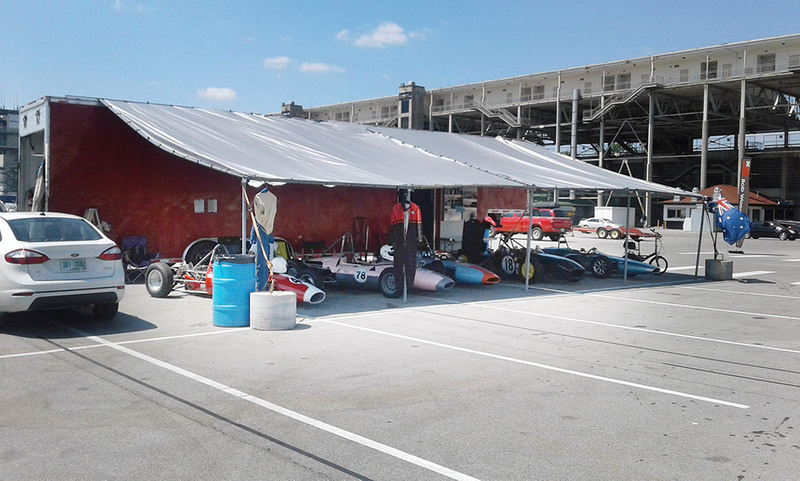 Our first meeting was at Indianapolis on the old GP circuit inside the Indy oval. We had allowed two days for the 1300 km trip to Indianapolis from Connecticut, on largely dual carriage motorways. The first thing that strikes you on these highways is the large amount of traffic, particularly commercial, even in rural areas. Driving such a large vehicle in a busy, strange environment was somewhat intimidating at first but we soon got the hang of it. However, the trip wasn’t to be without its dramas as only a few miles into the journey the water temperature climbed into the red. A quick roadside inspection revealed that the drainage tap at the radiator bottom had parted company and dumped all the water. What to do… no nearby town with a friendly Repco or similar. Luckily, we had lots of race car spares and tools so we managed to cobble together a fix which, with a helping of goo stemmed the leak to no more than a dribble. So, on our way once more, but we had to stop every hour or so to replenish the water lost from the leak. We planned to stop at one of the many truck stops en-route overnight but with all the delays it was quite late and we found most of the truck stops full up. We finally came upon one that had an unpaved overload area at the back. It was raining and there were lots of large puddles as we drove in. Unfortunately, one was a lot deeper than we’d anticipated and the trailer uncoupled and bogged itself as we drove into it. Several hours of digging and packing under the wheels finally had us reconnected and out of the hole. It was well after 1am when we eventually got to our bunks, parked outside a rubbish dump centre nearby. Not a lot of sleep for us that night as the rubbish trucks arrived for work at 5am with us parked in the way. With grandstands for over 100,000 fans, the Indy stadium is an impressive affair. Our three day meeting was without spectators as the organising club, with another meeting the following weekend, didn’t have the resources to entertain spectators at both events. The huge empty grandstands gave the place an eerie feeling when circulating. On the other hand, the circuit itself was a little underwhelming. Built in the Oval infield as an afterthought to entice the F1 to the circuit, and despite using parts of the Oval banked turns, it lacks character. 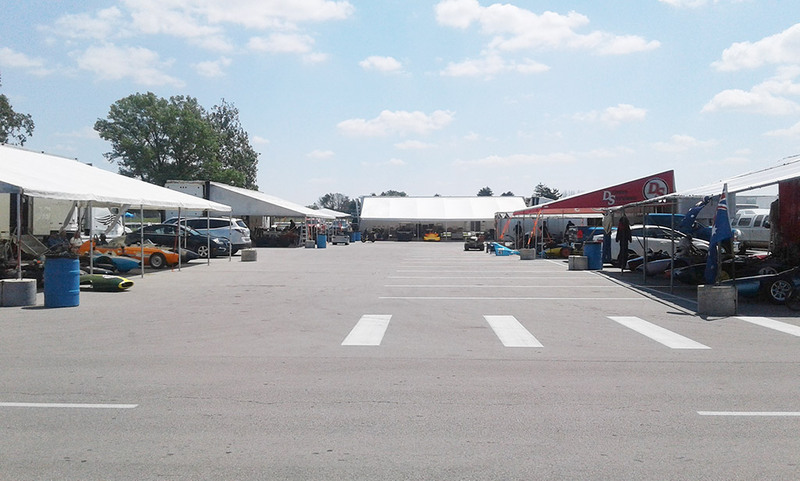 The paddock is of course huge and with three transporters, GMT Racing formed its own little ‘village’ for our cars. As expected, everything in the US is bigger than we have at home. The many trailers and motorhomes in the paddock are huge by comparison. One motorhome I think was bigger and more luxuriously appointed than my NZ home. However, the paddock and spectator facilities for crew and spectators were surprisingly unsophisticated and basic for such an iconic circuit. Not even so much as a mobile coffee shop in attendance. Luckily, we were self-catering so didn’t starve. The pick of the Formula Junior cars at the meeting was Joe Colasacco in his amazing Stanguellini Delfino with Martin Bullock not far behind in his Lotus 27. 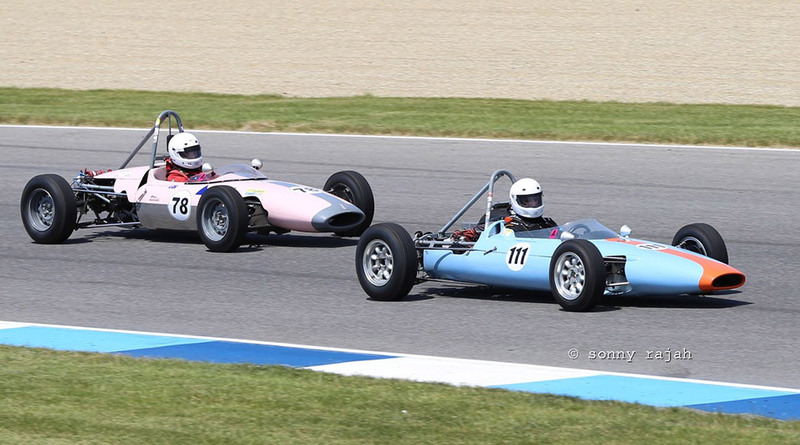 This was my first outing in the Panther and with only a modest engine and handling that could do with some fine tuning I languished near the back of the field in the races. Despite that it was great fun and I left Indy with a smile on my face. Nigel Russell from NZ joined us for the trip to our next meeting at Gosport near Toronto in Canada. The journey took us along the bottom of the Great Lakes crossing into Canada over the Rainbow Bridge near the Niagara Falls. The signage leaving the US wasn’t that flash and we missed the turn off to US Customs and Border Protection and ended up on the bridge into Canada without clearance. I don’t think we were the first to make the mistake as the Canadian Customs officials weren’t too perturbed and turned us around back over the bridge. The US officials however weren’t quite so obliging and gave us the third degree. US Customs and Border Protection must run special courses for their staff to ensure they’re the most grumpy, aggressive and unhelpful officials you’re ever likely to meet. Or maybe they’re just miserable because they’ve got a moron for president! TomTom’s first two attempts to find Mosport had us sharing green fields with livestock and not a track in site. We reverted to old fashioned maps and with the help of Nigel’s phone GPS some hours later finally found the circuit. Mosport, I was told, was Jackie Stewart’s favourite circuit and I can understand why. The downhill section after the start with blind, fast flowing corners is awesome and seriously challenging. What a wonderful circuit. Unfortunately, I had a bigend collapse in the first race so was sidelined fixing the motor for the remainder of the meeting. On the flip side it allowed me to watch some of the racing and I wasn’t at all disappointed to miss the second FJ race in torrential rain. Also racing at the meeting was a grid of 1970/80s F1 historic cars which were spectacular to watch on this fast-flowing circuit. However most of my time was spent heads down in the engine bay fixing the motor. 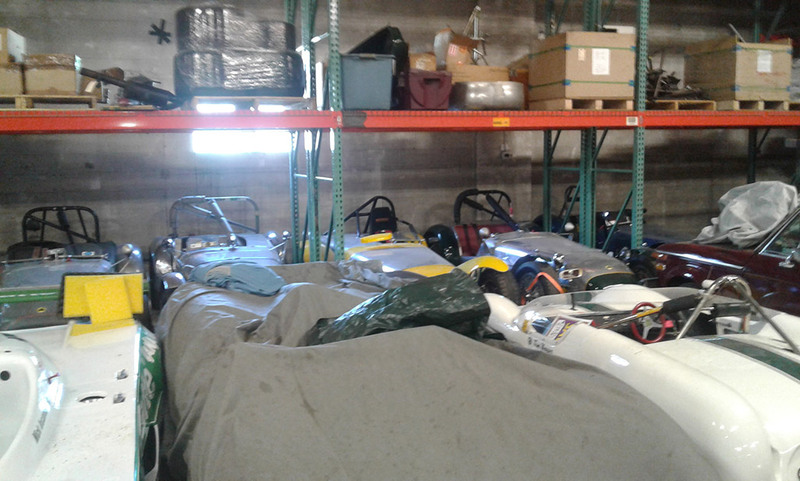 Sadly, I wasn’t the only one so engaged as we had some serious engine attrition among the Formula Juniors. 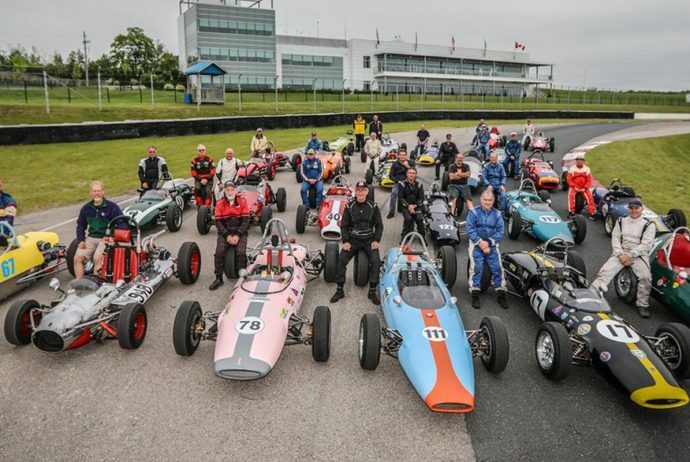 Greg Thornton in his Lotus 22 was the pick of the Juniors at Mosport with Marty Bullock (Lotus 27) again close behind. From Mosport we returned to the US for the next meeting at Mid-Ohio. Before we again crossed the border over Rainbow Bridge we decided to play tourist for a while and visit the Niagara Falls. The falls are a truly breathtaking spectacle and a must visit if you’re in the vicinity. 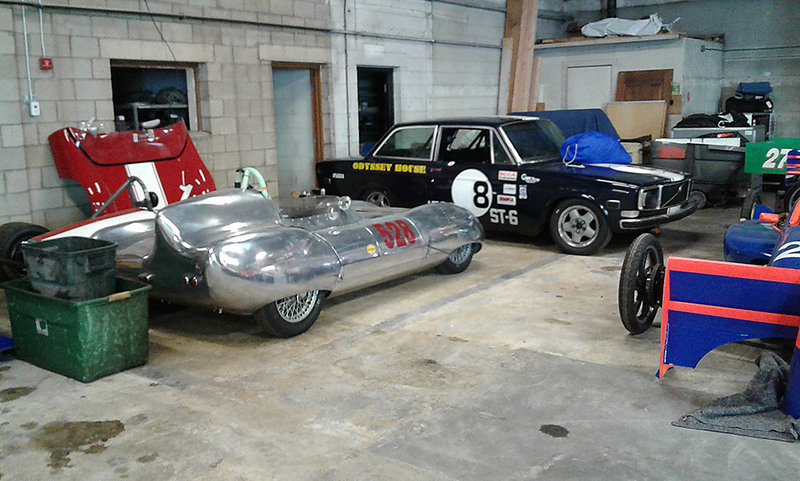 Nigel also had us visit a nearby deceased estate race car parts sale and came away with another Formula Junior restoration project for someone to complete. Anyone interested…? Unbelievably, we were processed by the same US Customs and Border Protection official who saw us into Canada – still not the slightest hint of a smile despite Lance’s best attempt at friendly banter. Mid-Ohio as with Mosport is in a rural setting with the undulating track winding through wooded landscape. It’s not as quick as Mosport but none the less a challenging circuit. I was still repairing the engine so missed the early track outings but by the narrowest of margins made the final feature race. Not having practiced and new to the track I, not unsurprisingly, brought up the rear of the field. 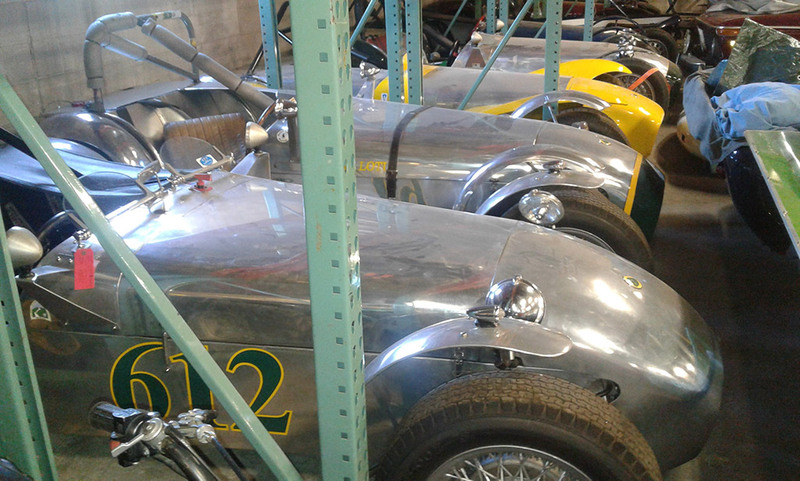 Joe Colassaco (Stanguellini) was again the star of the meeting with Greg Thornton (Lotus 22) close behind. That was the end of the first half of the US tour with the remaining four legs to be held several months later. 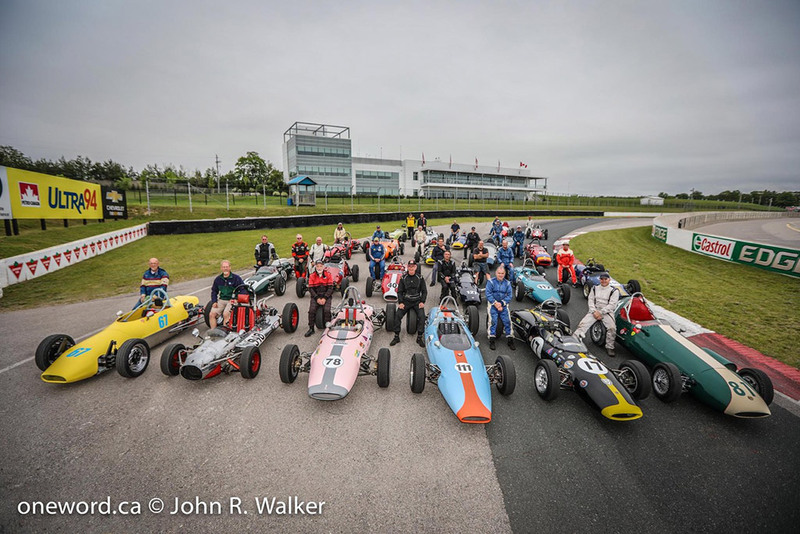 The Formula Junior family is a wonderful group with participants from all over the world and it was great fun to spend a few weeks with them both on track and socially. We had a very pleasant parting celebration at a local pub on the last Sunday night before we all went our separate ways. From a sporting perspective, it had been a slightly disappointing series for me in an unfamiliar and somewhat underprepared Formula Junior. Nevertheless, I was grateful to have the Panther to drive and had a lot of fun. All the meetings were well organised and run with lots of track time. The tracks themselves were in excellent condition but I was somewhat surprised at how run down the paddock facilities generally were. More old Pukekohe circuit than modern Hampton Downs. The Americans were as always extremely friendly and made us very welcome. When I needed a set of bigend bearings to repair the motor there unsurprisingly wasn’t a set to be found in the paddock but next morning I had three sets to choose from, found by helpful fellow competitors overnight from local sources. So my US adventure comes to an end. 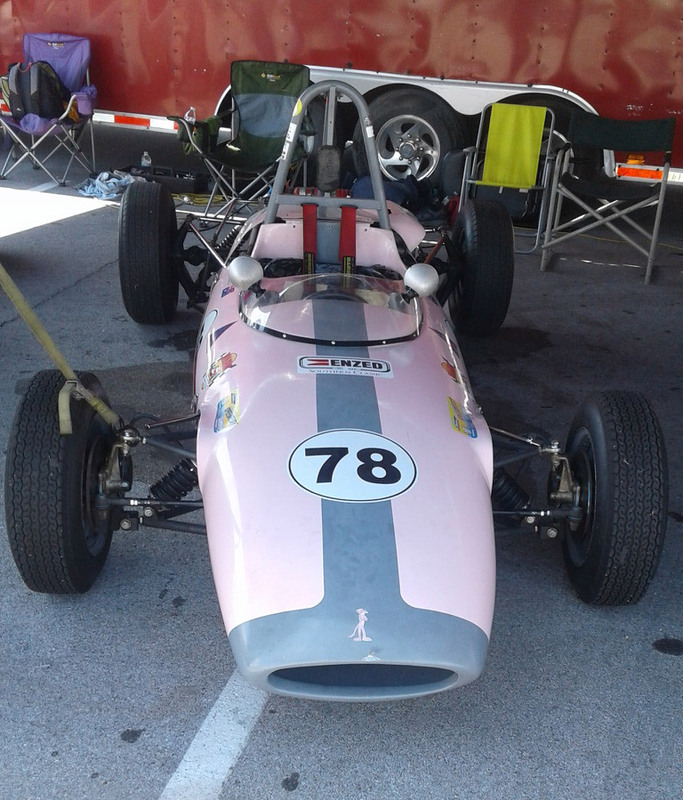 From Ohio I flew to Brisbane and on to Morgan Park to compete in the HRCC Historic Queensland meeting the following weekend in my Flintstone Lotus 23B. No rest for the wicked.